The Maui Mikoshi’s unveiling ceremony was hosted by the Honolulu Festival on Saturday, March 14, 2009, at the Hawaii Convention Center. 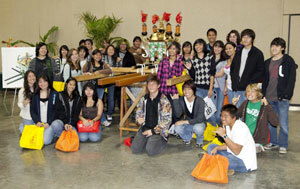 The Maui Mikoshi was designed by the students from Henry Perrine Baldwin High School which won the Honolulu Festival’s Mikoshi Design Contest for the second time. There were students, teachers and parents from Maui gathered at the unveiling ceremony. Furthermore, every audience was focused on listening to the speech by the representatives of students and teachers. Afterwards, few students drew the curtain that was covered on top of the Maui Mikoshi to see it for the first time. The students and audience applauded after they’ve seen the finished work. 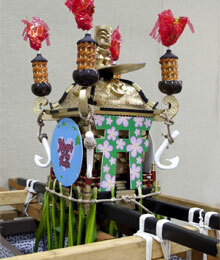 Each student contributed in designing the Maui Mikoshi which reflected their feeling and effort as well. Mr. Rory Sato, who teaches at Henry Perrine Baldwin High School stated “Group work was very important in creating the mikoshi”. Also, the students were able to build a strong bond with each other and united as one through this event. Furthermore, the designing of the Maui Mikoshi was like a fusion of Japanese and Hawaiian culture which turned out to be aesthetic. 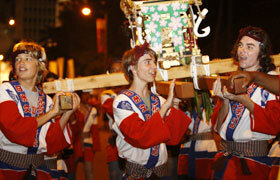 It also reflected the sub-theme of this year’s Honolulu Festival titled “Heart of the Pacific, Creating our Future”. 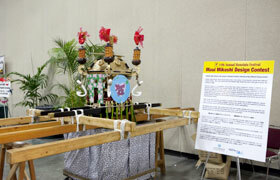 The Maui Mikoshi was displayed inside the Hawaii Convention Center after the unveiling ceremony. 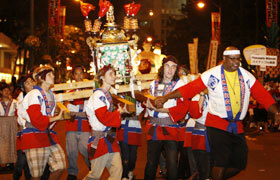 The students from Henry Perrine Baldwin High School carried their own Maui Mikoshi during the Grand Parade, which was held on the final day of the Honolulu Festival. 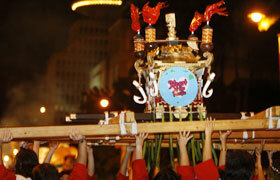 The students were excited to carry the mikoshi for the first time. They shared great memories by participating at the Grand Parade. The sub-theme of the 15th Annual Honolulu Festival “Heart of the Pacific, Creating our Future” was written on the mikoshi which was shining in the night of Hawaii.